In a bowl, add in yeast and warm rose water (around 98 °F). Let sit for 10 minutes. Then add in milk, sugar, salt, butter and egg. Mix well and set aside. Mix together flour and cinnamon. Make a well in the center of the flour mixture, and pour in yeast liquid mixture. Mix with a wooden spoon until well combined. Knead dough with hands for about 10 minutes. Place dough in a greased bowl and place in a warm place to rise for 2 hours. It should double in size. Cut and shape the dough into 18 balls. Place them on a cookie sheet 3 inches apart and pat them down a little bit. Set aside. In a mixer, add in strawberry milk mix, powdered sugar and butter. Whip until fluffy for about 5 minutes. Then mix in the flour. It should look like a thick paste. Shape the topping mix into a disk and wrap in plastic wrap. Place in the fridge for 40 minutes. Remove topping from fridge and roll it out between the plastic wrap. With a knife, cut it into strips. Place the strips on top of each dough ball, cut a design into each topping. Let the dough rise an additional 30 minutes. Preheat oven to 370 °F. You can make a chocolate topping by switching out the strawberry mix for chocolate. 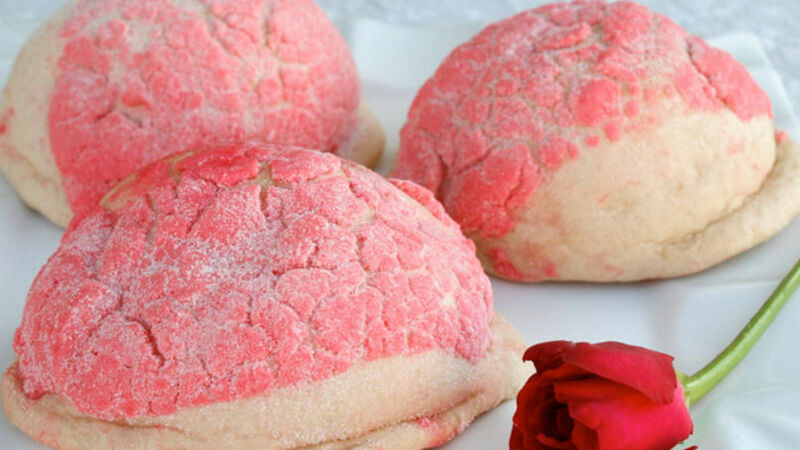 There is something magical about having pan dulce at the holiday table. It is ideal to share with the family; it makes my coffee or champurrado taste better and somehow the conversation a little more meaningful. Maybe I’m just a sentimental fool but there really is something extraordinary about those strangely shaped breads that bring people closer. Being the food explorer that I am, I sometimes make mine with rose water. It adds a natural sweetness to the already sugary taste and nobody expects it. But I only make them like this at Christmas time. For some reason, it has become a tradition for my household. They're pretty wonderful. Try them and see if you agree!